By default, all team members that are attached to a project will receive email notifications from that project. For example, if a client sends a project message then all team members will be notified. Also, any task updates will send an email to the team member and any watchers who are assigned to the task. This can result in a lot of emails being sent, so we have now introduced a setting to silence email notifications for individual team members. This can be set either by an admin, or a team member can choose to silence emails on their own behalf. 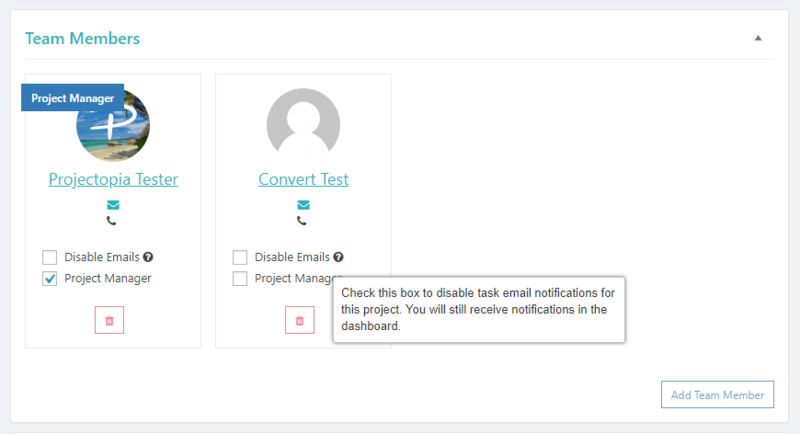 Since Projectopia 4.1, we we introduced an in-app notifications system, so the team member will continue to receive update notifications there, this will just disable the email notifications in specific projects. To disable email notifications in a project, simply check the “Disable Emails” checkbox in the project for the team members that you want to stop receiving emails. If a team member is accessing the project then they will be able to disable this themselves, but only for their own account.